Most effective home safety firefighting tool to extinguish more fire class types, easy to use, non-toxic and wipe clean. Be ready by having first alert house and office fire protection with Mini Firefighter extinguishing tool. 1.5million+ sold worldwide so far! Did you know? Fires double every 30 seconds. Important to stop fires fast. Homes av. 1 kitchen fire every 23 yrs., with 3 in a lifetime. Persons 65 yrs+ most vulnerable to fires. ✔️CONVENIENT AND EFFECTIVE - Eliminates flames by suffocating and cooling fire core to prevent re-ignition. Unique foam formula expands up to 40X its size! 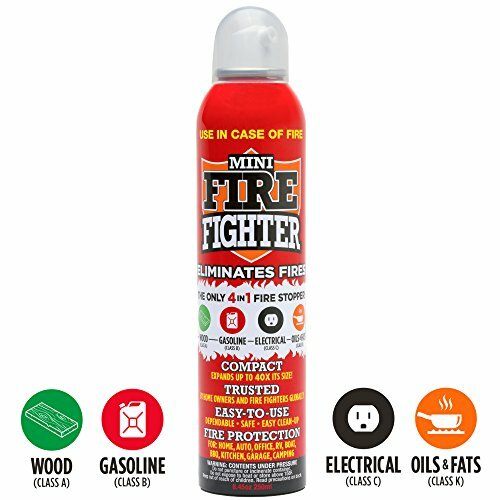 If you have any questions about this product by Mini Firefighter, contact us by completing and submitting the form below. If you are looking for a specif part number, please include it with your message.